I admit, I started with doubt. My wife came home with what Starbucks calls the January refill travel mug. For $30, it was a relatively inexpensive Christmas gift to each other. The concept of the January mug is pretty simple: you buy the mug, and during the month of January, Starbucks will fill it an unlimited amount of times. Once January 31st says hello to February 1st, you own a travel mug, and you can continue to get 10cents off the price of a cup of coffee anytime in the future. Whenever I hear the words “unlimited refills” it perks me up. And yet I doubted. $30 is steep. We really don’t need another travel mug. But most of all I questioned, is this actually a good deal? I definitely reveled in a fantasy sometimes when I handed my mug over to the various baristas. “I’ll have blonde roast this time.” They fill it up no questions asked, no money exchanges hands. I muse to myself that the people in line behind me are staring wide-eyed thinking, “How did he do that? What is this magical free refill mug in his hands?” Free refills feels good. That satisfaction evaporated when I did cost-benefit analysis. If I purchased the most expensive coffee allowable in the refill mug, which is a grande coffee with a double shot of espresso for $3.45 (specialties like lattes or mochas are not included in the promotion), it wouldn’t take long to see how this could be a good deal. 10 of those guys would do it. But to avoid my head exploding from caffeine overdose, I usually got a combination of regular and decaf. Even then, I would only need to buy about 15-20 cups. But who goes to Starbucks that many times in a month? Maybe those of you for whom Starbucks is your second office. For me, wanting to make this purchase worth it, I endeavored to fill the January mug 2-3 times every day. The mug itself says free refills are limited to one per day, but none of the Starbucks employees batted an eye when I kept coming back. Actually, at my very first fill-up, I asked “How does this work?” The barista responded that it was truly unlimited, so I went for it. Over and over again. My goal was 100 refills for the month. As I drank all that Starbucks coffee, what I realized I needed to do with the cost-benefit analysis was not compare the January mug with regular purchases at Starbucks. Instead I needed to compare it with brewing at home. We normally drink enough coffee at home to necessitate t he purchase of two 2lb bags of coffee every month. 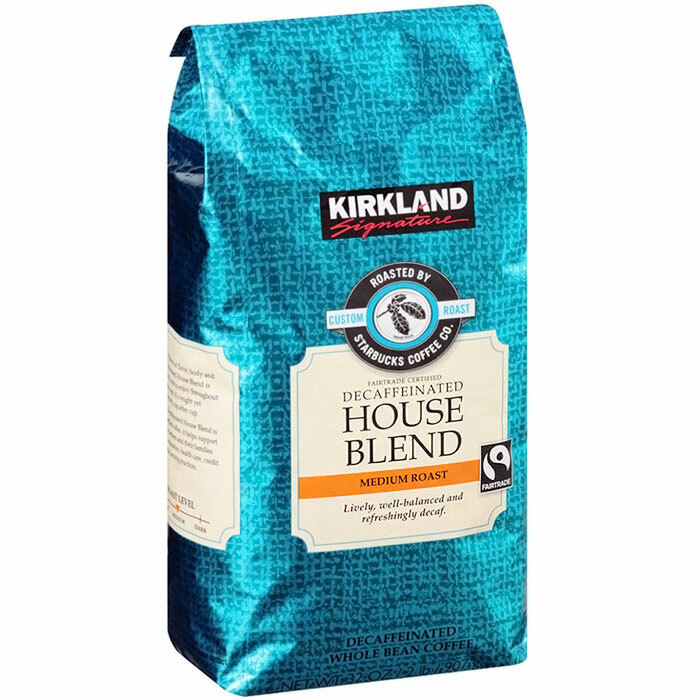 Costco sells Kirkland-brand fair trade coffee roasted by Starbucks. One bag of decaf and one regular costs a total of $25, and it sometimes lasts us a whole month drinking a pot or two each day. Admittedly, this is not a scientific analysis. But for $5 less than the cost of the refill mug, home brewing averages about one extra mug per day. We also save time and money by not driving to Starbucks. Because we have well-water, a permanent coffee filter, and equipment purchased long ago, our incidental cost of brewing at home is minimal, just a tiny amount of electricity, cream and sugar. The cost-benefit analysis result is clear: it is cheaper to brew at home. There is also another hidden cost that is hard to quantify, easy to ignore, but just may be the most important of all: Starbucks coffee hardly ever uses fair trade coffee, so I just went a whole month likely supporting slave-made coffee. That’s more than enough reason we never should have gotten the January mug in the first place and should seriously consider boycotting Starbucks altogether. On the positive side, there is something I have not mentioned, and it too is hard to place a value on: the interaction I had with the employees at Starbucks. Did we become friends? No. But if I would continue going through the drive-thru each morning, I think friendship could follow. Both the morning guy and the afternoon guy were very interesting and engaging, traits that were obvious even from only a few minutes of face-time each day. Who can put a price on that? I think Starbucks should continue the free refills for another month so I can make new friends! In the last few days as February neared, the guys asked what I was going to do when January was over. I told them about my cost-benefit analysis, and even gave them a spreadsheet version I made. Sadly, I said, I would stop coming to Starbucks. They were disappointed, whether due to company loyalty or our talks each morning, I don’t know. The afternoon guy had a wonderful idea. He suggested I make the last day a marathon coffee-drinking session. He even said that I could bring an urn, and keeping driving round and round the drive-thru, gradually filling it up, like Joshua and the battle of Jericho mounting a major circular offensive on the final day. I asked if I could invite all my friends to Starbucks and use my mug to fill up theirs too? He said, sure, why not? If my schedule would have allowed it, I would have tried it. Party at Starbucks! Free Coffee all afternoon! Then I thought, what if we turn it into a fundraiser? For every free cup of coffee people receive on that last day, we would encourage them to make a donation to the local Food Bank. We just might have to try, that is, if Starbucks runs the promotion again next year! Unless I decide to drive out to Starbucks one more time tonight, I just drank my last sip from the last refill on the last day. It’s been fun! Is something wrong if you are not making disciples? Have you ever made a disciple? By “making disciples”, I don’t mean disciples of yourself, but instead I mean disciples of Jesus. Have you ever helped a person grow closer to Jesus, be more committed to him? Jesus said the he would make his disciples “fishers of men.” Essentially, he was saying that he would help them do what he did. That takes us to our sermon last Sunday. Jesus did make those original disciples into fishers of men. He concluded his time with them by saying to them, “make disciples.” Once they had become his disciples, he wanted them to make more. And more. And more. So is something wrong if you and I are not making disciples? What if you have been a part of a church for years, maybe even decades, but you’ve never made a disciple. Is that okay? Is it bad? Is it possible, if you are not “fishers of men” that you are not a disciple yourself? One of the compelling statements from [a recent conference] was in reference to who could be a disciple-maker. One of our speakers declared that the New Testament expectations for those who would hold an official office in the church were extremely high. However, he went on to say, the qualifications for those who would make disciples are much, much less intense. His point was merely that disciple-making should be a normal function of every Christ follower. In the more healthy and growing expressions the global church, this is an expectation. Do you expect this of yourself? Does your church expect it of you? How so? How do you show that “disciple-making is a normal function” of your life? To be called or not to be called…the essential requirement for leadership in the church? This morning we continued a brief series I’m calling New Years Resolutions for Faith Church. We’re looking at two facets of the church that figure to be a significant focus for us in 2013: leadership and discipleship. Over the next month or so, we’ll unveil a proposal for changing our church governance structure. To prepare for that the first two sermons of the year took a look at a couple leadership episodes in the life of the first church. In Acts 6 the apostles decide to select new leaders to handle a ministry in the church. We explored that last week, and we saw that the apostles had a specific criteria for who would become leaders. Surprisingly, it was not their business acumen or ministry skills, but that they were full of wisdom and the Holy Spirit. Is that how we select leaders? Simply because they have distinguished themselves to be full of wisdom and the Holy Spirit? Fast forward about 30 years after that Acts 6 story, and we read the teaching Paul gave two young pastors, Timothy and Titus, about selecting leaders in their churches. What Paul shares are lists of character qualities that essentially boil down to one principle: leaders need to be people of spiritual maturity. Notice how very similar that is to what the apostles thought was important in Acts 6. Again, is that how we select leaders? Because they are the most spiritually mature in the church? What I found so interesting is that in both of these situations, there was something missing. Calling. And yet in many churches, we have elevated calling as primary, essential even to the selection of leaders. We have said that if God has not called them, they have no business pursuing leadership in the church, pastoral or otherwise. If that is the case, why doesn’t Paul, who was quite experienced with callings (read about his own in Acts 9), mention a peep about it? It would seem that if a divine calling is so vital, Paul would have least given it a nod. Instead he says in 1 Timothy 3:1 that the task of leadership is for “anyone” who “desires it”, “sets their heart on it”. People can choose to be leaders! Clearly, this is not to say that God does not call. He has in the past, and it seems to me based on many testimonies, that he still does. Sometimes in dramatic fashion, and other times in very subtle ways. Most importantly, when he calls, we should answer. What I have seen, however, is that for every person who feels called but has no business being a leader, there are ten, maybe a hundred, who are not called, and feel a sense of relief at not being called so they don’t have to serve. The lack of divine calling becomes for them an excuse not to serve. But what if the necessity of divine calling is actually a false premise for serving as a leader? What if all are called to serve the Lord, and all should consider the possibility that they might be gifted for leadership? What if, instead of a criteria of calling, we select leaders using the apostles (Acts 6) and Paul’s (1 Timothy 3; Titus 1) criteria of spiritual maturity? Furthermore, perhaps most importantly of all, this passage could serve as the impetus for us to pursue a deepening relationship with Jesus.